The Carlisle 608002 DuraPan™ steam table pan is stackable with other pans, and will not stick to other pans. 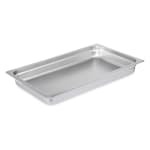 Impact-resistant edges hold their shape, enabling the pan to be used in food bars. Reinforced corners resist bending, and the pan has a 8.8/10.4-quart capacity. Unsure how the sizes for steam table pans work? We’ve put together a guide to steam table pan sizes for your benefit.